Here at Becket Primary School we take the protection and safety of our children very seriously. Our Child Protection Policy outlines the procedures and systems in place to monitor the safety of our children. The Head Teacher is the Designated Lead responsible for child protection issues. There is also a governor responsible for child protection. We work closely with parents and outside agencies in this matter. All staff receive regular child protection training. 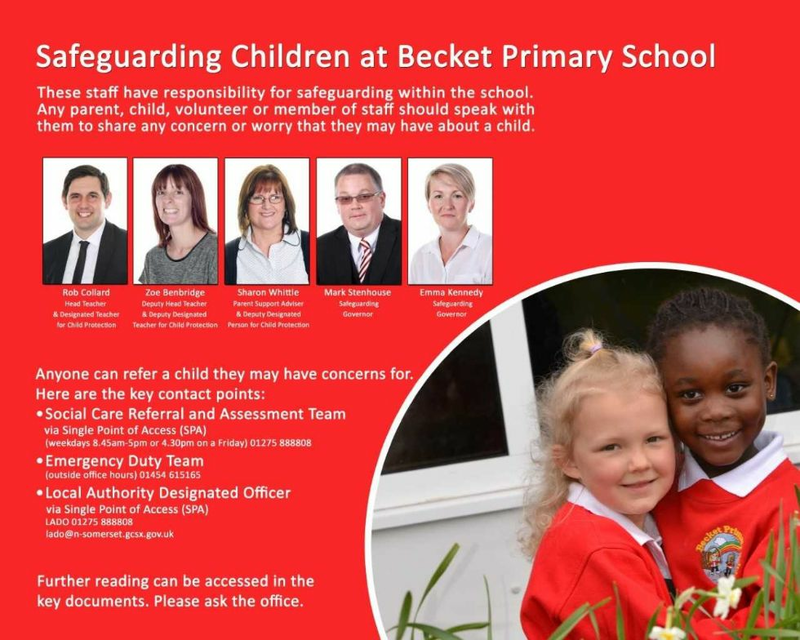 All adults working with children at Becket School undergo an enhanced police Criminal Background check before they are allowed to work with our children. We follow national and local government safer recruitment guidelines. If your concern is urgent and our school is closed, you can still contact us out-of-hours by sending an email to safeguard@becket.n-somerset.sch.uk any time day or night.